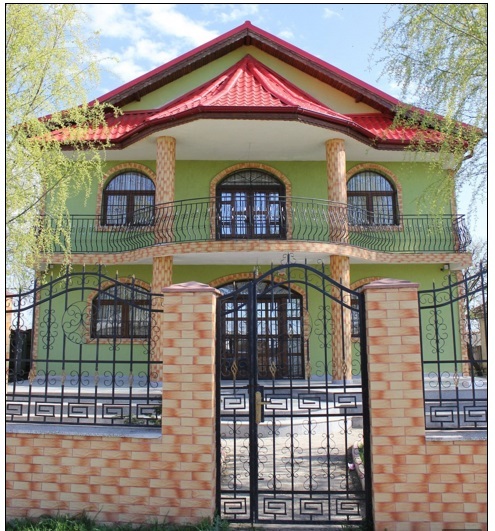 This is a "luxury mansion" in Romania. It is situated in a town called Tandarei, also known as Benefits Boulevard or a Gypsy Beverly Hills. It was financed by British taxpayers, either through benefits (handouts) or money given to beggar children on OUR streets. 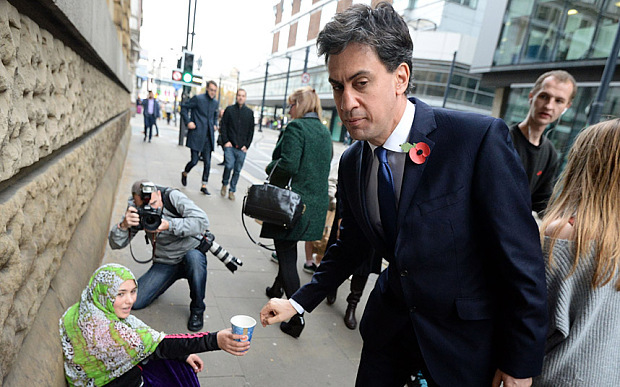 Even Red Ed Miliband personally contributed. There is photographic evidence. 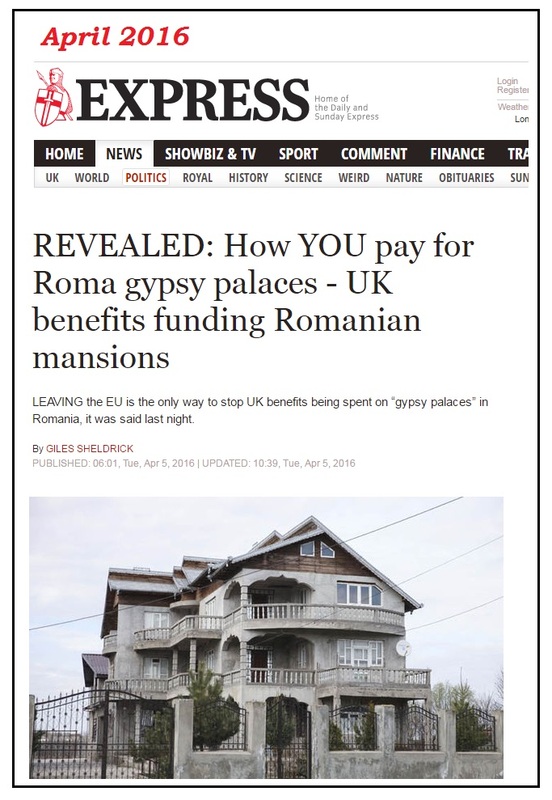 The scandal was the main item on the Daily Mail's website for part of yesterday, which struck SubScribe as odd, since it had been a spread in the Sun last Tuesday and the lead in the Daily Express the following day. Thanks for that Anna, but I'm afraid you haven't been concentrating. It goes back far further than that. The BBC's Orla Guerin saw the writing on the wall in the town 16 years ago and British and French police have been on the case since at least 2008. 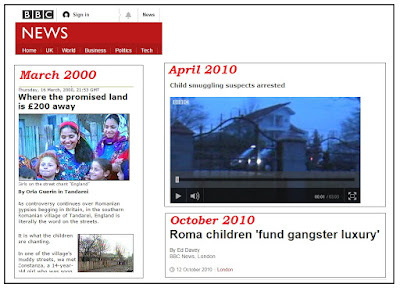 You can see footage of a 2010 raid there on the BBC News website here. Panorama went and took a look. As Anna Raccoon pointed out, the Mail and Sun have also been assiduous. We have had the school that was emptied as its pupils were shipped over to England to beg and the mutilation of those young beggars to increase their contributions to "Fagin-like" gangs. 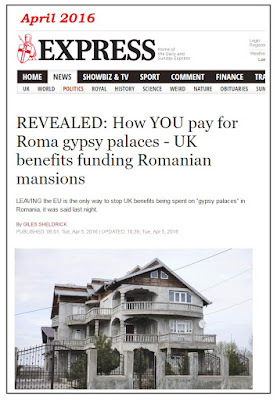 The Sun reported in January 2008 that they were earning enough for their gipsy masters to send £1 BILLION a year (the Sun's caps) back to Romania. Others put the figure at £1m, but what's £999m when you're out to make a point? Within a couple of years, extra notches had been added to the outrage meter to accommodate the expanding mercury. It was one thing to worry about child mutilation and slavery, but foreigners milking the welfare state was a far more heinous sin. Some people went to jail. And there was further indignation when a repayment order of just £17.65 was issued against some of the culprits. 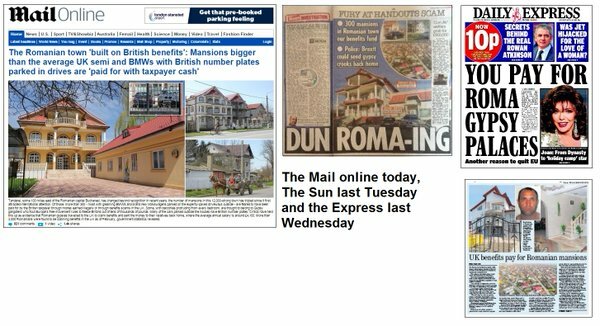 And now the Express has joined the party to "reveal" how we are funding grand homes. There seems little doubt that some problems relating to a few Romanians can be tracked back to Tandarei and that the baddies are no more welcome there than they are here or in France or anywhere else. Interest in the town spiked after Romania joined the EU in 2007 and again in 2013 when the country's status changed to allow access to UK jobs and benefits. And there was a flurry of excitement when an intrepid reporter managed to track the little girl who benefited from Miliband's coppers during the 2010 election campaign back to Tandarei. (If you remember, the then Labour leader was taken to task for appearing indifferent to her - but that was before we knew where she had come from). 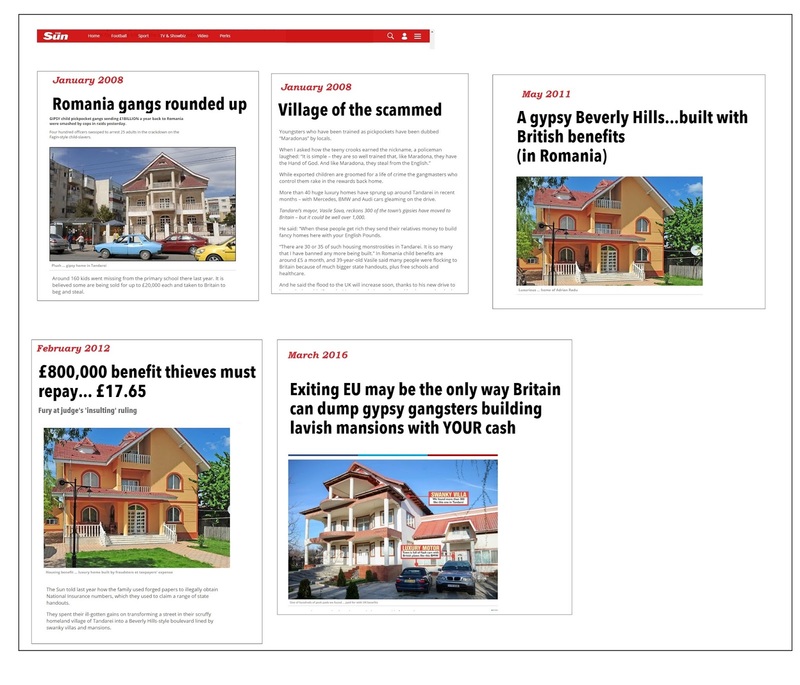 But why are we being told about these mansions now, with no police raids, court case or news event to warrant the reappearance of a story and photographs that first appeared online eight years ago? Oh yes, there's a referendum coming up. And what is REALLY interesting (my caps - it's the influence of the stuff I've been reading) is that while a Mail story about the town in 2009 attracted 39 comments, and its 2011 "Benefits Boulevard" offering brought forth 162 comments, this week's regurgitation has been shared more than 8,000 times and elicited more than 2,000 comments. Indeed, in the time it has taken me to put the pictures for this post together this afternoon, it has been shared a thousand times. 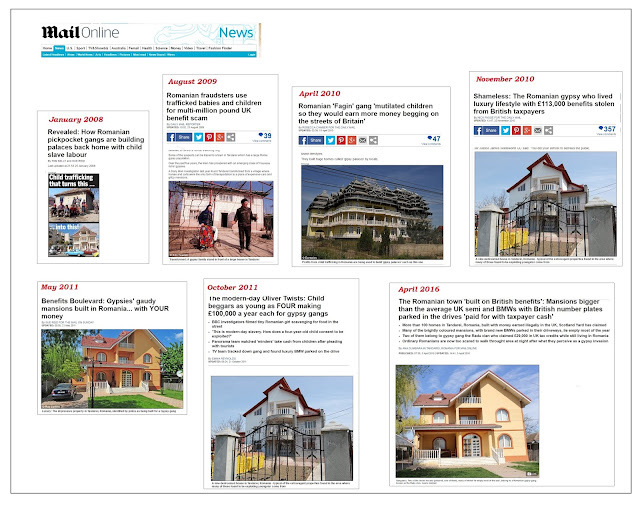 The thing is, the same people and the same houses from the same town feature in these articles all down the years. Which suggests to me that far from being a widespread problem, it is very tightly focused and limited. And perhaps not representative of Romania or its people? One of the commenters on the latest Mail version of the story notes that one of the "luxury" BMWs photographed is a model that is 12 years old. Is that because it's an old car - or an old photograph? It's also worth noting that some of the benefit fraud offences involving people from Tandarei dated from 2003 - four years before Romania joined the EU. So whatever your views about the community and Britain's membership of it, SubScribe would like to suggest that your decision on how to vote in June should not be coloured by the mansions of Tandarei. Because this journalism is as empty as they are.